If you are looking to upgrade your current version of FusionPBX to the next release version click here. The FusionPBX code is constantly evolving. A complete summary of the changes can be found on the github code page https://github.com/fusionpbx/fusionpbx/commits/master. Go to the menu then click on Advanced and then Upgrade. This tool allows you to update the source code, update the database structure, restore the default menu and permissions. Click here for the Youtube video. To upgrade you will need to get the latest source code. Depending on how extreme the changes have been or the version you currently are on since your last update, you may need to follow version specific upgrade instructions to bring your install up to date. Used to update FusionPBX to the latest release. Login into the web interface with a user account assigned to the superadmin group. Login to the console with either the ssh, the locally. Backup It’s a good idea to make a backup. If using sqlite, your backup will easily include the SQL database. 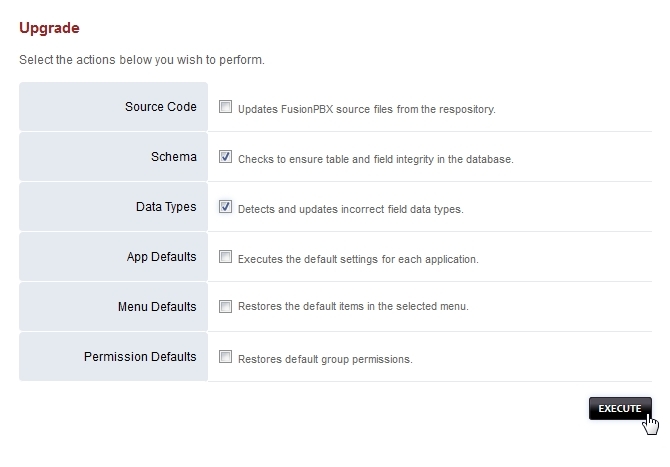 Reset the permissions on the fusionpbx directory tree. When you do git pull it sets the permissions on any updated files to match the account that you are running git pull with. If that account is different to the web server account it will result in some files no longer being accessible and a red bar error at the top of the upgrade screen on the GUI. 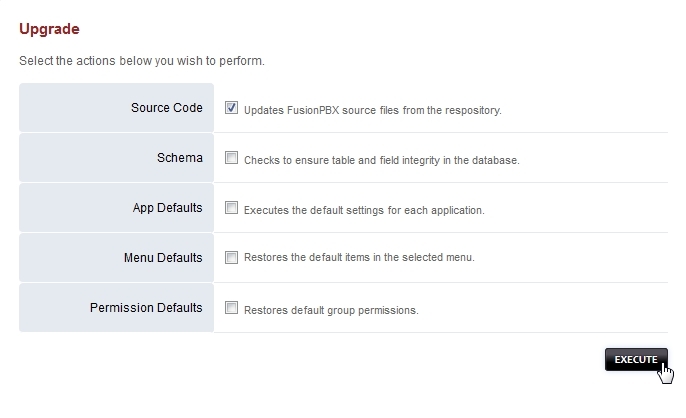 To fix this you should reapply the permissions in fusionpbx and recursively in all directories inside it. NOTE: As of FusionPBX 3.8.3 (Stable Branch), the scripts should be automatically updated when updating the Source Code, using the Advanced > Upgrade page. Any customized scripts, having the same name as the default scripts, will be overwritten. (An option to disable this default behavior is available using Default Setting: switch > scripts_update > false) Missing scripts will be restored, and any additional files within the scripts folder will remain untouched. FusionPBX is a fast moving project where features are constantly being added and bugs are being fixed on a daily basis so I would also suggest upgrading the Freeswitch scripts directory as part of any normal upgrade process. Use github to get the updated files. You have to do this from an empty directory. Here you need to go directly to step 3 and make sure you run upgrade schema from the GUI immediately otherwise your calls will not complete. If your config.lua file was located in scripts/resources/, then you’ll need to restore it (from the backup previously performed) to scripts/resources/config.lua. From the GUI, run Advanced -> Upgrade Schema which will add any needed newer tables or columns. Then run App Defaults. If you removed the scripts on Step 2 then run this twice. An alternative to running upgrade_schema.php from the GUI is to run the upgrade.php from the command line. It was designed to make the upgrade easier. If you did not login when updating the FusionPBX source code then you will need to run the upgrade.php file from the command line. Make sure to use the full path to the PHP file. Then scroll down to where it says “Template” and select one of the valid templates from the drop down list. Then press Save. It will be fixed now and you can continue with the remaining steps below. Needed if your menu disappeared. Now update the menu to the latest version. Press ‘Restore Default’ on the top right. click the restore default button. Sometimes variable names changes. In rev 1877 v_config_cli.php variable names changed which caused no fax to email emails or voicemail emails to be sent. Problem was the SMTP details did not exist. Go to Advanced -> Settings and then click save. This will re-generate v_config_cli.php and any other needs config files. FusionPBX has a stable and a master(development) branch. You can switch from stable to master but not recomended to downgrade. Make sure config.php exists in /etc/fusionpbx If missing then move it into this directory. If the menu disappears you have to upgrade schema then restore the default menu to get it back.